Since 1959, when her mother, then the president of the Tucson Women’s Bowling Association, drafted her to chair a committee to raise money for needed equipment, Marilyn Hensley has been a diligent worker for, and promoter of, women’s bowling in Tucson and throughout Arizona. In 1965, Hensley was elected to the TWBA board and in 1976, was president-elect when Tucson successfully bid for the WIBC Tournament and Convention. 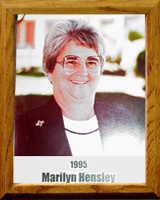 Sixteen years later, Marilyn was still president, and served as tournament coordinator, when the WIBC voted to return to Tucson. As president of the Arizona’s Bowling Council, and the Grand Canyon Bowling Council, and as a board member of the Tucson Young American Bowling Alliance, Marilyn is active in junior bowling and was a member of the bid committee for the 1992 National Junior Coca-Cola Tournament, of which she was tournament coordinator. Marilyn has been recognized for her dedication to the AWBA; was named Outstanding Member of the AWB Writers in 1983; and is a member of the Tucson WBA Hall of Fame. She has also been recognized by the WIBC as Outstanding Volunteer and received the AMF/Bev Ortner Award as the Outstanding Member in the WIBC tournament city.